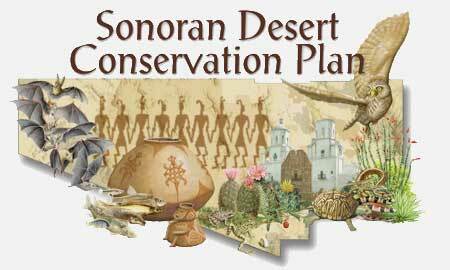 The award-winning Sonoran Desert Conservation Plan (SDCP) is Pima County’s plan for balancing the conservation and protection of our cultural and natural resource heritage with our efforts to maintain an economically vigorous and fiscally responsible community. The SDCP considered the following elements: critical habitats and biological corridors, riparian areas, mountain parks, historical and cultural preservation, and ranch conservation. All five elements, along with fiscal analysis, were critical in forming a viable land management plan for Pima County. The SDCP identified the types of development that improved the tax base, and the relationship of these with the sewer service area. Build-out analyses showed that not all land would be needed for urban development, and that certain types of development would be costly to the tax base as well as to various community values that were identified through over 600 public meetings. Over 200 technical reports documented these values, using the combined talents of over 150 contributing scientists. In 2001, the Pima County Board of Supervisors updated the Pima County Comprehensive Land Use Plan, integrating the land-use policies and principles of conservation developed in the SDCP, including the Conservation Lands System or CLS. The CLS identifies lands necessary to achieve SDCP biological goals, while delineating areas suitable for development. The CLS covers approximately 2 million acres in eastern Pima County. The CLS was renamed the Maeveen Marie Behan Conservation Lands System in 2009 in memory of Dr. Behan’s work on the SDCP and development of the CLS. Since 2001, the SDCP has guided where public money is spent to conserve important natural areas, providing the basis for how cultural and historic resources are protected, and serving to help insure that our western lifestyle, heritage, and traditions continues. Read more on accomplishments here. The SDCP set the stage for later efforts such as the City-County Water Study, and re-investment in the County’s sewage treatment facilities, and created a new standard for public transparency and involvement. The Multi Species Conservation Plan (MSCP) is the part of the SDCP that deals with compliance with the Endangered Species Act. Conservation in Pima County, Get Involved! Leave a legacy. Donate your property to Pima County's open space program. To date, 17 different owners have donated over 2400 acres of land that have been protected as County conservation areas. Donations may include life estates. To inquire, use the "Send Department Feedback" button on the right side of this screen. Volunteer to care for natural resource parks and trails. Come visit County Ranch Lands ! The Pima County Native Plant Nursery grows or salvages over 200 species of plants for public projects. Tours and volunteer opportunities are available. For additional information, please contact Jessie Byrd, Native Plant Nursery Manager at Jessie.Byrd@pima.gov or (520) 488-8022. Video produced by the U.S. Fish and Wildlife Service about the history and key elements of the Sonoran Desert Conservation Plan. This video is being used by the Service as a training tool for Service staff, private entities, and other juridictions that are interested in undertaking broad-scale conservation planning. Book chapter on the science behind the Conservation Lands System. Information on Pima County Department of Transportation's Environmentally Sensitive Roadways Guidelines and native plant salvage program. Information on Pima County Regional Flood Control District's riparian restoration projects. Please visit the Sonoran Desert Conservation Plan Map Room for specific map tools such as SDCP Mapguide and SDCP vision map pdfs.